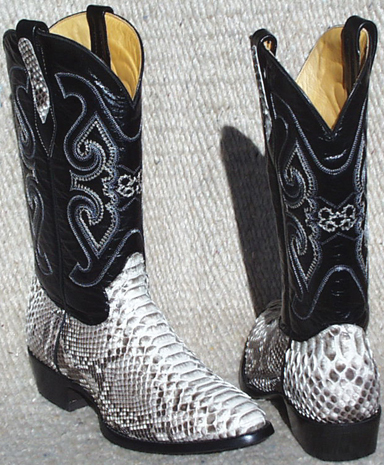 Natural Python boots. Python belly up. (Actually called back cut python, because the snakeskin is cut down the middle of the back for this belly to show.) Black brush off goat shaft. Made for Cultured Cowboy. This is a "Best Seller" boot especially made for us. Leather outsole on an all leather upper. Glove lining. 13 inch top. Medium Round (R) toe. Slightly underslung walking heel. Handcrafted.